The New York Times produced a wonderful essay of vintage ski photos, which inspired us to delve into our own photo archives and see what sort of images we had taken from the slopes over the years. Here’s a selection from the hundreds of photos we discovered. Wearing army ponchos, a group of women lined up to board a lift at Stowe, Vt., on Feb. 15, 1946. The ponchos served as protection against the wind as they rode up the mountain. Upon reaching the summit, the women would remove the ponchos and send them down in the empty chairs. 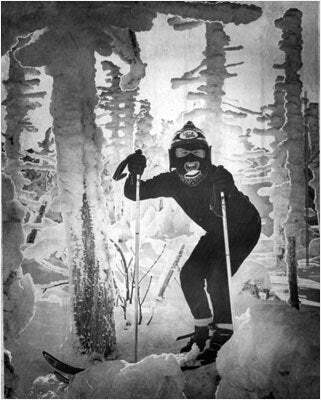 Win H. Smythe, 70, sat on train tracks on Feb. 26, 1938, and spoke with 17-year-old Harry Muzzy, of Worcester, after skiing the Thunderbolt Trail in Adams. An undated photo of a Sunday at Wildcat Mountain in Pinkham Notch, N.H. 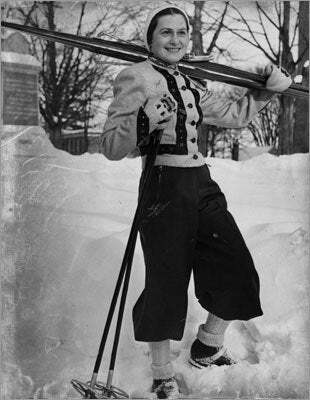 Skiing champion Madame Maria Singer taught students from Mt. Holyoke College at Mt. Tom in 1938. A group of friends at Franklin Park in the 1940s. 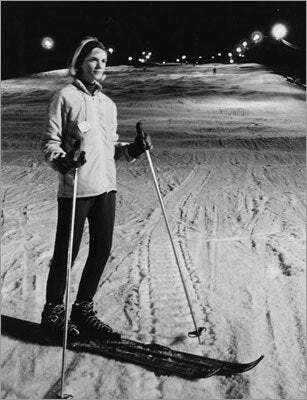 In 1961, Jack McTarnaghan, chief instructor of “Ski-Dek’’ led a class through the “newest recreation’’ of indoor skiing by teaching fundamentals such as snowplow and parallel turn. Ski-Dek supposedly duplicated the feeling of skiing on a snow-covered slope. 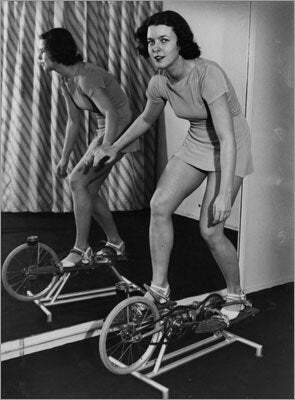 More indoor skiing: A woman took a skiing/biking/treadmill-like device in 1939. A ski school class at an undisclosed location in 1965. 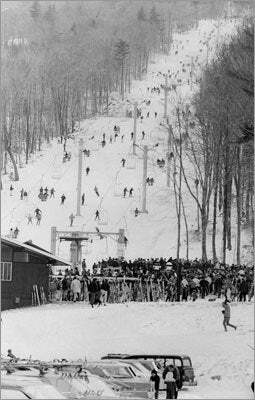 Skiers waited in line at Blue Hills in Milton on Jan. 6, 1970, in order to fork over $5.50 for an all-day lift ticket. More than 600 New Yorkers arrived in Pittsfield aboard the “Snow Clipper’’ in 1932. Skiers swirled down the Lord’s Prayer at Bromley Mountain in Manchester, Vt., on Nov. 30, 1951. It was the earliest skiing in Bromley’s history following a 9-inch storm earlier in the week. A ski jump was set up at Soldier Field in Chicago in this photo taken Feb. 12, 1938. Snow for the meet was imported from Upper Michigan to cover the slide. A skier rode the Viking Tow in Gilford, N.H.
Skiers who arrived in North Conway, N.H., by “Snow Train’’ made their way through downtown toward Mt. Cranmore. According to the Globe file photo caption, “They do not bundle up, depend on exercise for their warmth.’’ Note the Five and Dime in the background. The store remains there to this day. 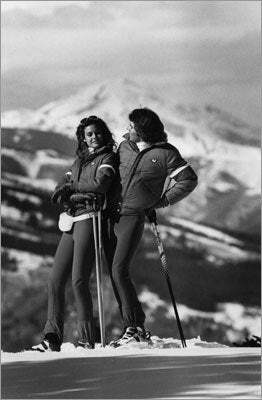 A couple stood atop a mountain in this ski fashion shot from 1985. Sandy O’Brien, from Meriden, Conn., posed at Mt. Tom in Holyoke. No date given. 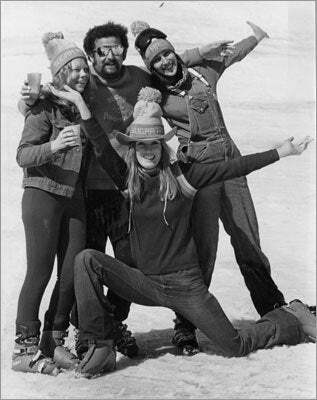 Members of the Sugar Magnolia Ski Bum Racing Team posed at Stowe, Vt., in 1977. 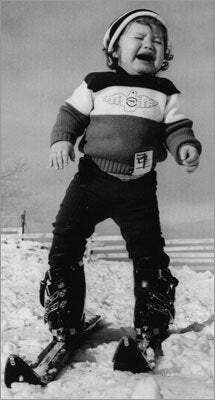 Fifteen-month-old Mark A. Raimer did not appear to enjoy his first skiing experience in 1975 near North Adams. Laney O’Brien, 21, of Falmouth, took a break on March 9, 1977 with her dog, Leo, at Wildcat Mountain in Pinkham Notch, N.H.
Ann Pawlowski, a ski instructor at Gunstock, taught her two-year-old son, Dean, at the Gilford, N.H. ski area on Jan. 31, 1973. Two-year-olds Dean Pawlowski and Heidi Track at Gunstock in Gilford, N.H. Both were the children of ski instructors. Photo taken on Jan. 31, 1973. 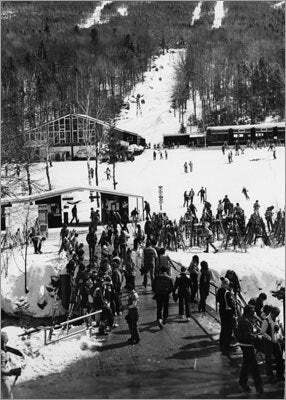 Skiers took advantage of warm weather at Waterville Valley, N.H., in 1986. 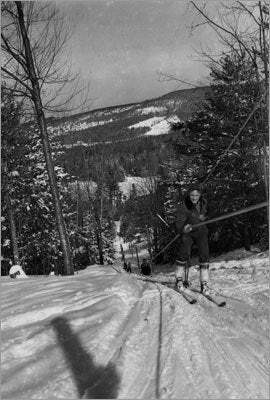 A skier navigated Taft at Cannon Mountain in Franconia Notch, N.H., in 1939. A child and best friend learned to play on snow at the Wellesley Golf Course on Jan. 5, 1974. 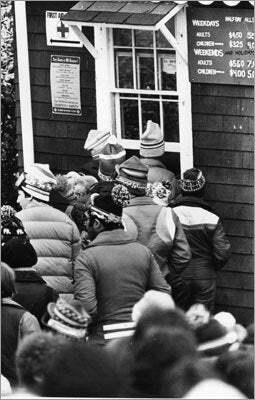 A crowded scene at Killington Mountain’s Snowshed Lodge on Nov. 21, 1965. A skier rode the Mt. 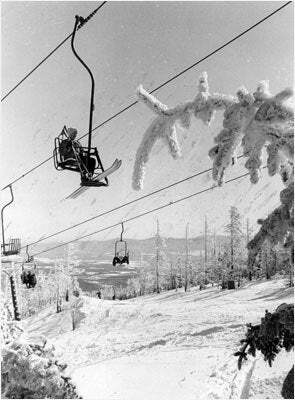 Mansfield single chair lift as it crossed Stowe’s Lord trail in 1976. An Eastern Slopes ski school instructor showed skiers the proper method of doing the “stemboggan’’ at Cannon Mountain in this photo taken Dec. 15, 1938. A boy showed off his appreciation for “Lost in Space’’ in this unspecified location. No date given. Richard Hardauas pulled his son, Travis, up the hill while skiing on Boston Common in 1974.